How are investors positioned and what do they want going into the autumn reopening? 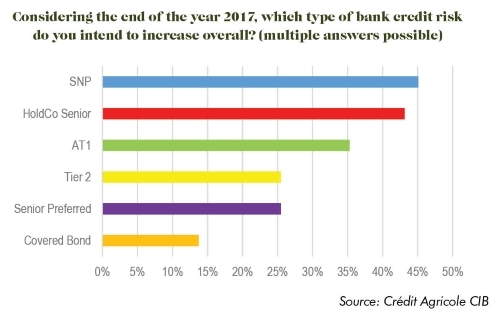 Such questions were central to an inaugural survey by Crédit Agricole CIB syndicate conducted in the wake of unprecedented action to tackle failing banks and ahead of key central bank decisions. It found an increasingly discerning buyside ready to absorb supply, but lacking direction. Neil Day reports. Published 29 August. Click here to download a pdf of this article. Senior non-preferred is the instrument most cited by investors as the type of bank credit risk they intend to increase by year-end, according to a Crédit Agricole CIB survey, which found little evidence that pre-summer bank resolutions will have a negative impact, but conflicting expectations around spreads. 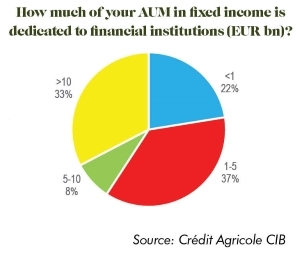 Fifty-two investors participated in the survey, conducted by Crédit Agricole CIB FIG syndicate from 2-21 August, with almost a third having more than EUR10bn of assets under management dedicated to investments in financial institutions (see below for more on survey participants). Asked which type of bank credit risk they intend to increase overall by year-end, 45% of investors chose senior non-preferred (SNP) — just ahead of forerunner HoldCo senior, on 43%. This is despite almost half (49%) of those surveyed saying senior non-preferred are expensive versus senior preferred notes, with just 19% believing current levels to be correct. According to 38% of respondents, senior non-preferred should rather be called “Tier 3” and be priced closer to Tier 2. Some 14% expect spreads on outstanding senior non-preferred to underperform on the back of primary market supply in existing and new jurisdictions — Spain and Belgium have been establishing their legislation and issuers from such countries are expected to enter the market in the autumn. However, one investor noted that valuations should tighten as issuers’ layers of senior non-preferred (and any further subordinated buffer) grow. A widespread risk-on attitude is reflected by 35% of respondents intending to add Additional Tier 1 (AT1), the third-most preferred option. A significant minority, 22%, will nonetheless either not add bank credit risk (16%) or reduce it (6%). The survey was conducted in August, in the wake of the resolution of Spain’s Banco Popular and the winding up of Italy’s Banca Popolare di Vicenza and Veneto Banca in June. A muted market reaction and successful new Spanish bank capital issues (click here for coverage) suggested investors were sanguine in the face of the tests of Europe’s post-crisis regulatory regime, and the survey confirms this. Asked how the pre-summer developments had influenced their investment behaviour, 43% of respondents saw the events as isolated cases, with their appetite for subordinated debt unaffected. Only 6% said that they had resulted in higher rating constraints. However, the price issuers have to pay for Tier 2 relative to other instruments could rise, with 57% of those surveyed citing reduced appetite for Tier 2 and/or expecting higher spreads — notably versus AT1 — to compensate for revised PoNV considerations after Popular Tier 2 was wiped out alongside its AT1. “Appetite not affected,” said one investor. “Been mainly involved in national champions. 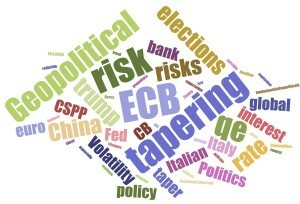 QE: a risk in tapering, or underpinning tight levels? Compared with the enthusiasm for increasing holdings of senior non-preferred, HoldCo senior and AT1, only 25% of respondents intend to raise exposure to Tier 2 this year. Recent events have also had a spillover effect on the senior non-preferred sector, with 29% of respondents expressing lower appetite for the instrument and/or requiring greater compensation in light of the Spanish and Italian experiences. Just 25% of respondents also intend to increase senior preferred exposure, and only 14%, covered bonds. Comparing the two asset classes, 45% of investors believe senior preferred to be too expensive versus covered bonds, while 43% consider them correctly valued. To 15%, whether issuers are national champions or second tier names remains important, with a couple of investors rather investing in the senior non-preferred of national champions. Lower enthusiasm among some investors and for some bank instruments may be explained by concerns over a possible global correction in financial institutions credit spreads: 39% of those surveyed expect such a scenario. Responses also correspond with the intended weighting in favour of subordinated bank debt: 24% expect high beta instruments to outperform low beta, and only 11% vice versa. However, there is no clear consensus on the outlook, with 31% agreeing technical supports are strong and that current spreads could remain the status quo for a while because of QE. 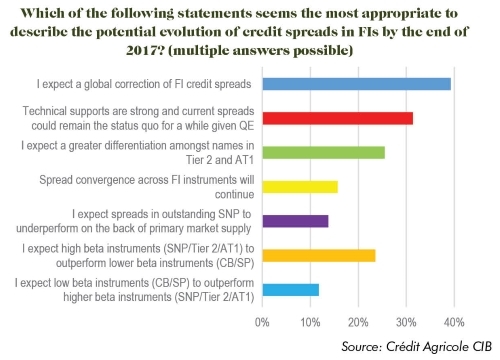 Perhaps unsurprisingly, a variety of outwardly discordant opinions on spreads co-exist: 16% of those surveyed expect convergence across bank instruments to continue, while 25% expect greater differentiation amongst names in AT1 and Tier 2. The number one cloud hanging over the market is ECB tapering, according to investors’ responses when asked what is the number one risk factor into year-end 2017. However, geopolitics is widely cited as being at the forefront of respondents’ minds, with a combustible combination of Trump, North Korea and China among risks cited, alongside more typical EU concerns, such as Italian elections. 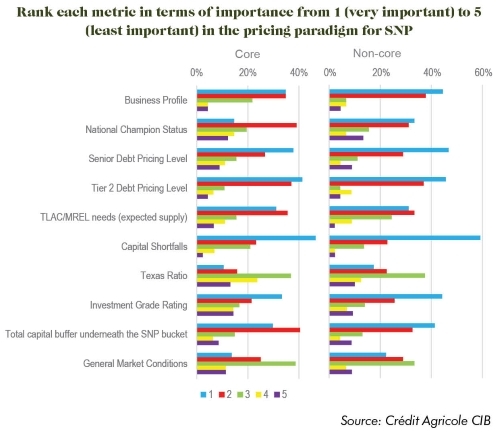 When asked in more detail about the relative importance to SNP pricing of various metrics, respondents were given the chance to provide different answers for core and non-core European jurisdictions. However, investors’ answers suggest that there is little divergence between their approaches across markets — the top metrics across both core and non-core are any capital shortfalls, senior and Tier 2 pricing levels, and business profile. “People are focusing on the issuer’s profile and name-specific metrics,” says Hoarau, “not jurisdiction. A year ago, investing in Italian banks may have been a no-go for some investors regardless of size, for example, but now it’s all about the whether they like the credit or not, and that’s very good news. Investors’ views on senior non-preferred pricing should be tested by banks from Spain and Belgium after the two countries followed France in establishing a legal framework for the instrument. The survey clearly suggests that the pricing approach of choice is to apply a percentage of the distance between the issuer’s outstanding senior preferred and Tier 2, with 57% of respondents saying this is most sensible. And in line with the above findings on the diminishing importance of different jurisdictions, just 10% selected an option of playing relative value versus French and contractual Spanish SNP levels. 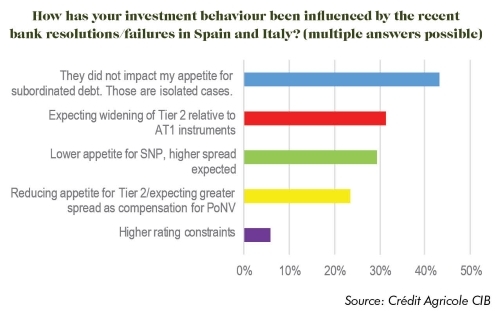 The survey further asked investors what the percentage distance between senior preferred and Tier 2 should be for senior non-preferred in Spain, Belgium and also Italy. Again, there was little divergence between jurisdictions: the average percentage distance for Belgium was around 45%, and for Spain and Italy 50%. For Spanish non-investment grade, diverse responses nevertheless centred around 60%, while for Italian non-investment grade over half of respondents believe the percentage should be more than 60%. Investors were also asked what basis point premium senior non-preferred should offer versus senior preferred for the different classes of issuer. This generally came out at 20bp-50bp for Belgium, 30bp-70bp for IG Spain, and 40bp-80bp for IG Italy. There was little consensus on sub-investment grade Spain and Italy, with premiums of anything from 30bp to over 150bp selected. Of the 52 accounts participating, 73% of respondents are asset managers, 16% insurance companies, 6% banks investing on their own behalf, 4% family offices, and 2% hedge funds. The survey took in a cross-section of European accounts as well as a significant minority (18%) of investors further afield. Sixteen of the accounts surveyed (33%) have more than EUR10bn of asset under management (AUM) dedicated to investments in financial institutions, four (8%) have EUR5bn-EUR10bn, 18 (37%) EUR1bn-EUR5bn, and 11 (22%) less than EUR1bn. Senior preferred is the FIG asset class to which the most accounts are open to invest in, at 96% of those surveyed, followed by senior HoldCo (94%) and Tier 2 (92%), with 88% of respondents investing in the new senior non-preferred instruments. Two-thirds invest in AT1, while 71% take covered bonds and 33% asset-backed securities (ABS). 37% of those indicating their current holdings of senior non-preferred hold more than EUR100m of the asset class, with 28% holding EUR50m-EUR99m and 28% EUR1m-EUR49m. Two said they do not hold any senior non-preferred paper, while another noted they have sold down most of their initial purchases and now, for example, no longer hold any euro SNP. The FRN format has taken hold in senior non-preferred, with 72% of respondents buying floating rate paper, but 28% do not. Among those that take FRNs, for 67% these constitute less than 15% of their senior non-preferred holdings, while for 15% it is around a quarter of their holdings, for 11% around half, and for 7% around three-quarters. Private placements are a possibility for 31% of respondents, but not for the other 69%. Five years is the preferred tenor for senior non-preferred, chosen by 58% of respondents, followed by seven years (37%), three years (23%), 10 years (15%), and shorter than three years (10%). Issuance with a call one year before maturity has become an increasing feature of the senior HoldCo market and investors appear ready to accept the structure in senior non-preferred format: 87% of respondents said they would buy such callable SNP paper, and only 14% not. 46% of accounts view the fair value of such a call at around 10bp, with 24% opting for around 15bp and 8% for 5bp. While 40% of respondents are restricted to investment grade-rated financial institutions securities, the same proportion face either no rating constraints or limits that kick in at a lower, sub-investment grade level — although several of these cited a bias towards IG-rated instruments. Two accounts are limited at crossover credits, while others said constraints vary across mandates or did not answer. Investors face few geographic constraints on their financial institutions investments: some two-thirds did not cite any restrictions, with a further 10 accounts only restricted to OECD or developed market economies. While a handful cited a regional focus or restrictions for technical reasons such as indices, the only stand-out exclusion was Greece, with three investors still declaring it a no-go jurisdiction. Despite having expanded into Tier 2, the burgeoning green bond market does not yet encompass senior non-preferred issuance — indeed regulatory questions over the potential for such instruments remain open. However, 82% of those surveyed would consider buying green SNP notes, even if only 58% said they invest in green bonds — a quarter do not consider the green feature of issuance to be relevant, although a few expect to grow their participation. Of those who do invest in green bonds, these typically constitute only less than 5% of their investments — and many declared themselves ignorant of the significance of such holdings.